Any one who thinks being married is all bliss must not have been in one yet. Let me tell you, they are not…well at least mine is not. Its nothing new to hear that two people who come from two different places and spaces are going to think two totally different ways. But I don’t believe it has to cause such tension. 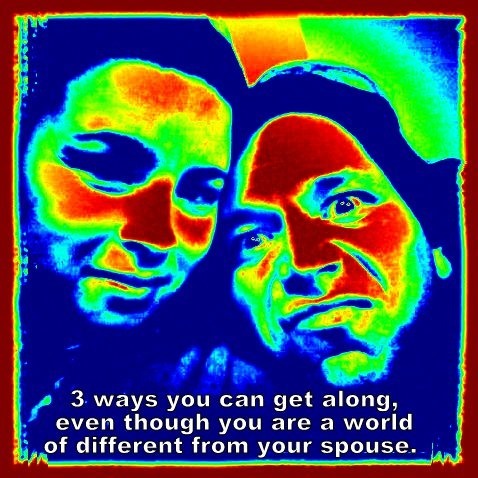 3 ways you can get along, even though you are a world of different from your spouse. 1. When triggered and wanting to react. STOP! The worse mistake I have made more times then I care to say is to speak when I am triggered by something I don’t like. Often it comes after I hear a certain tone of voice. Tone is very important to my ears. It tells me everything I need to know about what you are saying to me. ( or so my reactive emotions would like to believe ) and this is why the FULL STOP helps. Triggers are often hot buttons. Things that violate your passion places and values. They can also be linked to the past…like for instance the way my dad use to raise his voice at me and the angry tone he used. Best thing to do is assess if I am living in the now…then deal with what is alive in me. When I don’t get the reaction from him that I am expecting and I am not happy and most likely brooding on it creating a cesspool of volcanic emotional crap. I can choose to sit and stew or I can move toward him in love. Sometimes all I do is reach out and touch his arm. This lets him know I am letting it go right now, not allowing myself to think myself into being pissy with him all day. Not that I am dropping the issue but that I am choosing to be loving toward him and I will bring it up later when we can talk without expectations. John 13: 34-35 A new command I give you: Love one another. As I have loved you, so you must love one another. 35 By this everyone will know that you are my disciples, if you love one another. Sounds easy but sometimes it is harder than you think especially when you an over thinker like me. I overanalyze on a daily basis. I am a recovering –still in process recovering vague speaker. ( you know…read my mind!!!) Being honest means I have to say what I feel and what I didn’t like about what happened and be willing to go through what ever comes back at me. I tend to think if I say I don’t like that, it will stop. Well that is rare! Most the time he needs, just like I need constant reminders to be unselfish in certain areas that are habitual to me. So going around the mountain is a given and walking together is called marriage! Ephesians 4:25 Therefore, having put away falsehood, let each one of you speak the truth with his neighbor, for we are members one of another. So change is never overnight and the goal is transformation in how we engage one another. Actions speak louder than words and they tell you when the other person is slipping. MAKE CONNECTING the goal !